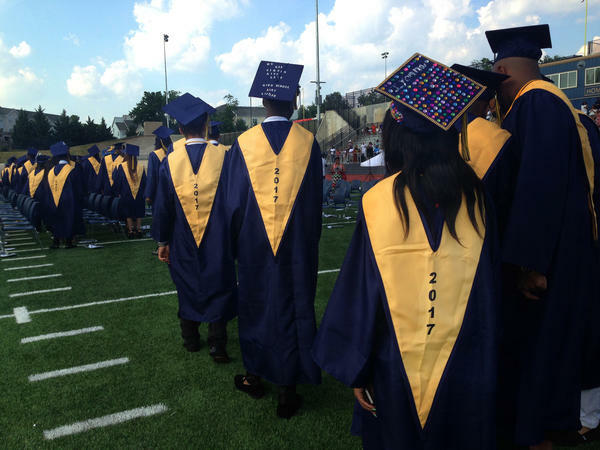 That happened last week with a powerful piece from NPR and Washington, D.C. member station WAMU about a high school in one of D.C.'s poorest neighborhoods where last spring, for the first time, every graduating senior was accepted into college. As reporter Kate McGee reported, a months-long WAMU/NPR investigation "found that Ballou High School's administration graduated dozens of students despite high rates of unexcused absences." The investigative piece, which was picked up by other news outlets, followed a very upbeat NPR report last June about that senior class college acceptance rate at Ballou. My office received an email from a reader wondering why, in light of the subsequent WAMU/NPR reporting, NPR had not retracted the initial piece. "The extraordinary claim of the original should have set off alarm bells," wrote a listener who said she lives in Charlottesville, Va. In addition, Alexander Russo, who writes about how media outlets cover the education beat, wrote and tweeted about the issue: "NPR found enormous problems at Ballou high school — and in the process debunked their own previous coverage. But a belated update is all they're willing to concede?" His tweet drew a wide range of responses, agreeing and disagreeing. Wednesday, John Merrow, who formerly covered education for The PBS NewsHour and before that worked for NPR, posted his own critical thoughts online. Editor's note, Nov. 30, 2017: Since this story was originally published, we've done additional reporting. We spoke with 11 current and recent Ballou teachers and four recent Ballou graduates, and we reviewed hundreds of attendance documents, class rosters and emails. They show that many students graduated despite chronic absenteeism. Records show half the graduates missed more than three months of school, or 60 days. Please find our updated story here. The original piece is somewhat startling to read, given what we know now. As the story points out, the graduation rate in the 2015-16 school year was 57 percent. That year, only 3 percent of students met citywide English standards and no one passed the math. The question in any reporter's mind should then be: Was the 2017 progress simply too good to be true? Merrow questioned on Twitter whether WAMU/NPR was pitched the story. If so, he said, that should have been "another reason to be suspicious" of the graduation rates (which was not the focus of WAMU/NPR's piece — the college acceptances were). Acacia Squires is an NPR editor responsible for working with NPR member station reporters whose work on the education beat appears on NPR's audio and digital platforms. She edited both pieces and shared a byline on the first piece. The first piece, she told me, was not pitched by the school district. An editor in the newsroom saw a report in the Washington Post (here's one) that said 100 percent of Ballou students had applied to college. The editor brought it to the attention of All Things Considered, which in turn asked the education reporting staff to look into it. By the time McGee started reporting, the school told WAMU/NPR that the story had changed: Not only had 100 percent of the students applied to college, they had also been accepted. Squires said McGee did not take the high school's claims at face value. The original reporting put into the piece included 90 minutes spent with a staff member who oversees college and career preparedness programming. Student Trayvon McKoy was interviewed twice; two teachers were interviewed (and did not say anything about the truancy issues). The reporter observed a class where freshmen were talking about a recent school-paid trip they'd taken to a university campus. The principal was interviewed twice. Squires called it "a feel-good story with caveats"; the piece did not ignore problems at the school, including the fact that more than one-fourth of the teaching staff quit during the school year. On its face, the report in late June was accurate; as the headline said, the students did get accepted to college (some of them to a D.C. community college that accepts all who graduate, information which was only uncovered later by McGee). Still, a story can be accurate but incomplete, and therefore leave a misleading impression. The report also included this line: "But it was a strong support system within D.C. Public Schools that made it a reality." There appears to be truth in that: The story documents the college application support, the pep rallies and the paid-for college tours the school system provided. But it's also an ironic truth, in retrospect. The school may have provided lots of support but, as the second story showed, it also subsequently graduated students who did not meet graduation requirements. That included overlooking "high rates of unexcused absences." How high were those rates? As NPR and WAMU reported last week, "Half of the graduates missed more than three months of school last year, unexcused. One in five students was absent more than present — missing more than 90 days of school." So WAMU/NPR did not fall for a P.R. pitch. It invested time in reporting. Why did its report fail to turn up the other problems? The follow-up investigative story makes that clear, citing a "district employee" who shared private documents as the source of the data that underpins the story. It was the first story that led to the second, Squires said. McGee was reporting on teacher terminations later deemed wrongful and got in touch with a source who had seen the first piece and directed her to the Ballou documents. Squires said that in retrospect, had there been more time to continue reporting, WAMU/NPR could have expanded its source pool for the first story to include some of those teachers who left during the school year. Nonetheless, she said she is "happy we did that story," since it ultimately led to the much bigger investigation that "has now prompted two separate audits into the district, the school and its graduation policies," as well as the reassignment of the principal. "The school did indeed give diplomas to seniors that day who had — every one of them — been accepted to college. There were extra resources and support provided to the school in an attempt to raise the graduation rates. We reported the reasons district officials told us for the success, and we also noted what we knew then about the struggles and problems along the way. We also noted the fact that the impressive numbers did not include students who had dropped out of school along the way. In other words, we reported the story with the best information available to us. Which is what journalism is: You report what you know at the time. And when you learn more, you report that, too." He added, "Journalism is, always has been, a snapshot of a moment in time," and said, "The assumption here seems to be that we somehow should have known in June about the information we learned later. But we didn't know it yet because it was information that we only got because people came forward after seeing our original story." My take? The first piece was far from perfect. It contained some overly enthusiastic language about Ballou's accomplishments (I like feel-good stories as much as others, but unqualified statements are often what get reporters in trouble). The claims the school made were hard to believe — which should have made the newsroom more skeptical. If the reporting team needed more time, it should have been granted, despite deadlines. But this situation also underlines one of the challenges of reporting: when to stop. Often the reporter's instinct is to keep reporting, but deadlines are a reality, after all. I don't believe the reporting was slapdash (some reports I found in other news outlets simply took Ballou officials at their word and did not do any original reporting at all), but it is unfortunate that of all the people talked to, not one raised the problems that became apparent later. Perhaps one more interview would have been the one that unlocked the bigger picture. Still, that subsequent report is the far more important one. NPR and WAMU kept reporting, even though by doing so they underscored the missing elements in the first piece, and they provided a story that seems, should the audits confirm it, to reveal a troubling pattern of behavior at a D.C. school that is seemingly harmful to students. It is important journalism. That is ultimately a good outcome.